We’ve previously noted in these pages Francisco del Rosario Sanchez, one of the Dominican Republic’s founding heroes, who in 1861 was shot for propounding independence. Martyrdom was the family business. That date, February 27, also happens to be the Dominican Republic’s Independence Day celebration — because a year to the date before her death, Maria Sanchez, her brother, and others of the anti-colonial La Trinitaria proclaimed independence from a bloody 22-year Haitian occupation. Maria Sanchez, together with another woman named Concepcion Bona, made the first Dominican Republic flag. 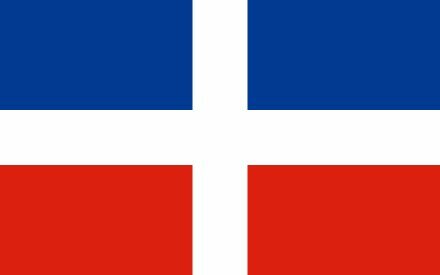 Sanchez and Bona’s original flag for the Dominican Republic. This was all well and good, until the resulting head of state steered the Dominican Republic towards recolonization by Spain, as a hedge against reconquest by Haiti. La Trinitaria types took an understandably dim view of this gambit, so busting them up was part of the deal. Many of the country’s founding heroes, including brother Francisco, were chased into exile; Maria was rounded up by the new government and tortured for information about the Trinitarian “plots” against the new regime. 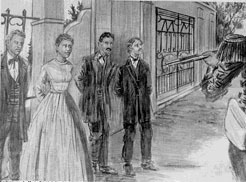 She refused to name any names, and was shot on the country’s first independence anniversary.